What follows are summaries of the original 1867 tournament and the 100-year anniversary tournament in 1967. They were both very strong chess tournaments, and are fascinating to explore. 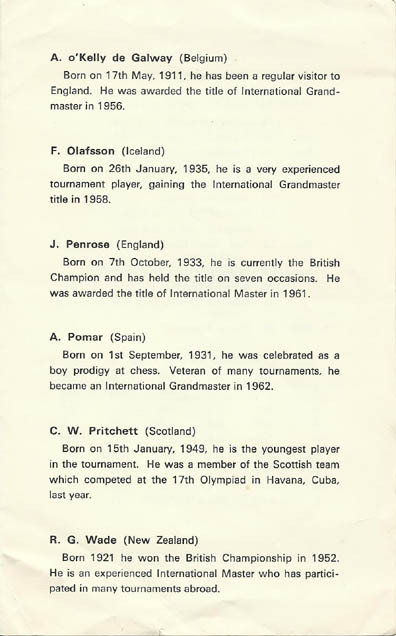 The information here is based on the Chess Scotland history archive which itself is taken from the book The Story of Dundee Chess Club by Peter Walsh (1984) and Scottish Chess, a bulletin produced by the former Scottish Chess Association. The 1867 Dundee International Tournament was a very strong chess competition. 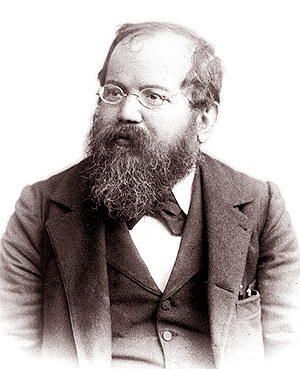 The undisputed strongest player in the world at the time, and the first World Chess Champion, Wilhelm Steinitz, took part, along with the best players from both Scotland and the rest of Britain. It was a very innovative tournament for several reasons - for the first time a draw was given half a point instead of the players starting a new game until there was a winner; and at the beginning of every game the players tossed a coin to decide who got white or black. The Handicap Tourney, where stronger players were disadvantaged by having fewer pieces than their opponents at the beginning. 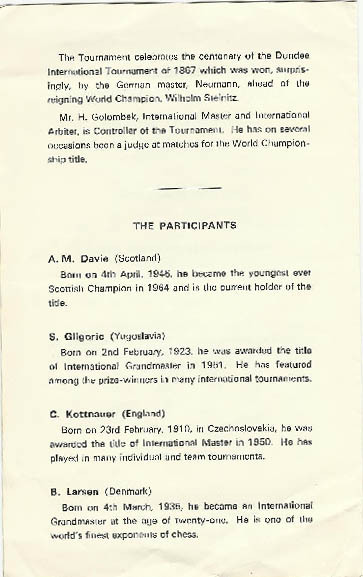 This was won by Steinitz and Dr Fraser from Scotland. The Scotch Tourney, for Scottish players only. This was won by Dr Fraser, previously mentioned. There was also a book which can be found at Google Books. It is not exclusively about the tournament but might make for interesting reading. 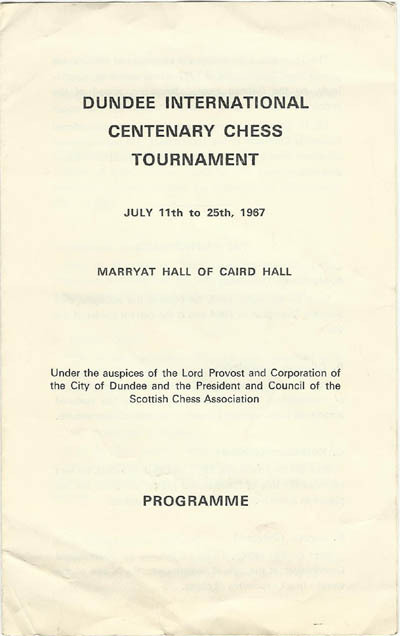 The 1967 tournament was held in the Caird Hall, and Dundee also welcomed the Scottish Championships, which is also the plan for the 150-year anniversary tournament. Players included Bent Larsen, one of the leading players in the world, and Grandmasters Gligoric, Galway, Olafsson and Pomar. Unfortunately, Pomar became ill during the tournament so had to withdraw, so it finished with nine players instead of the ten with which it had begun. The tournament was won by Gligoric, with Larsen and Olafsson finishing equal second.